Rohm is a Japanese company established in 1958 that is making discrete semiconductors, passive components, displays and integrated circuits. 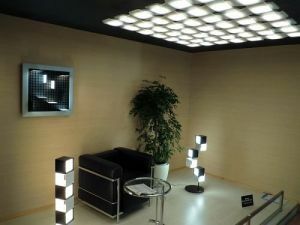 Rohm has an active OLED program working on OLED Lighting (Rohm owns a part of Lumiotec), displays and microdisplays. Rohm developed a new (2nd-generation) OLED lighting panel that uses a red phosphorescent material. The new material results in a more efficient device - about 25-30lm/W, up from about 11lm/W in their first-generation all-fluorescent device. Lumiotec (which is partly owned by Rohm) will start producing these new panels in "volume" within a few days (Lumiotec reported earlier that it will make around 60,000 panels a year). The new panel's size is 145x145mm (the same size of Lumiotec's older panels) and will cost ¥30,000 (about $365) - which is cheaper than Lumiotec's first-gen panels (the whole development kit used to cost The kit costs ¥84,000 - about $930). 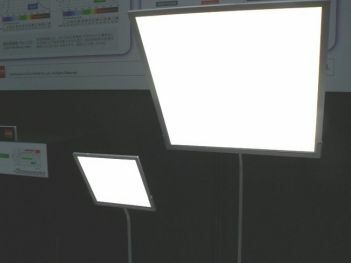 Lumiotec will also introduce other shapes and sizes. Here's our review of Lumiotec's older OLED Lighting panels. UPDATE: We have some new photos from Engadget (who's got a video, too). Rohm is showing a new wristband with an OLED display. 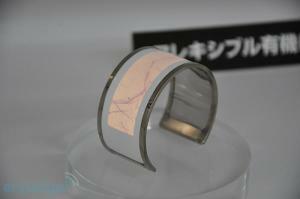 Their idea is that OLEDs can actually be used in jewelry or a watch band. OLEDs are expensive, but so are jewelry pieces so they think that it might be a good usage for the technology. 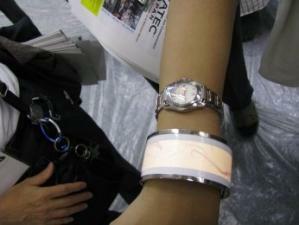 The OLED in the wristband is 0.3mm thick, and run via a small lithium-ion battery. Rohm is also showing OLED table lights (one inch wide, 4 inches tall). One of their OLED lamp prototypes consumes about 300 milliwatts. 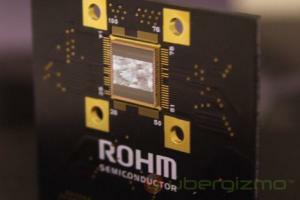 Rohm had two OLED items at CEATEC. The first is a 'shadowless' OLED lamp. The lamp is using a 'complex' array of OLED panels so that objects beneath it has no shadow. The second item they had on display is an OLED Flash. 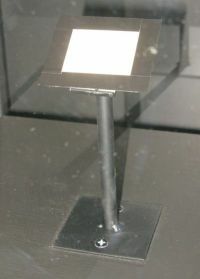 The flash can emit light with a high luminance (100,000cd/m2). The flash can also be used as a 'regular' OLED lamp, with a luminance of of 3,000-4,000cd/m2 or higher. 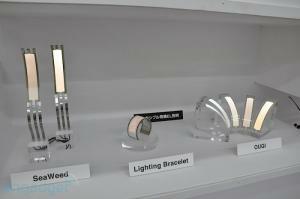 Researchers from Kyoto University together with Mitsubishi Chemical, Pioneer, and Rohm have developed a new bendable OLED display panel. We do not have a photo of this display, but they did present a monochrome (blue) business card-sized prototype. The researchers say that their technology can be adapted to full-color displays.